The most sickening (I mean truly vomit inducing) thing about the Al Jazeera revelations, the so-called Palestine Papers, is not what they confirm about the quisling status of the impotent and corrupt Palestine Authority. Nor is it what they confirm about the Israeli leadership’s complete lack of interest in peace on terms other than those which require the Palestinians to surrender – to abandon their struggle for even an acceptable minimum amount of justice. What then is the most sickening thing? For example, in a post on 15 September last year with the headline Does the Palestinian diaspora care enough to become engaged? I asked this question.What can the Palestinians do to help themselves? My answer (first put forward more than two years ago) was the following. They should wind-up (close down) the discredited PA and put policy making and implementation back into the hands of the Palestine National Council (PNC), which is supposed to be (it once was) the highest and most supreme Palestinian decision-making body. To become relevant again it would have to be reconstructed and re-invigorated by elections to it in every place where there are Palestinians – the occupied West Bank including East Jerusalem, the Gaza concentration camp and the diaspora. In their claim for justice, I wrote, the Palestinians have 100% of right, legal and moral, on their side (whereas the Israelis have 99% of the might, conventional and nuclear, on their side). If this claim was properly presented and pressed by a credible Palestinian leadership, by definition a democratically elected leadership duly authorized to represent the views of all Palestinians, it would be more difficult for the governments of the major powers, the one in Washington DC especially, to go on refusing to use the leverage they have to end Israel’s occupation of Arab land grabbed in the Zionist state’s 1967 war of aggression. (Not self defense as Zionism asserted and succeeded in getting most people in the Western world to believe). In that context and the light of Al Jazeera’s revelations, the first main message of a reconstructed and re-invigorated PNC, addressed to the Israelis but also for the attention of the governments of the world, would be something like this. Yes, I know, that’s an unthinkable concession to the reality of Israel’s existence for some and perhaps many dispossessed Palestinians at present, but it does not necessarily have to be the end of the right of return story. Why not? Because it’s not impossible that after a generation (perhaps two) of living side by side in peace with the Palestinians in a mini state of their own, many Israeli Jews would conclude, or at least be open to the idea, that there should be one democratic state for all, possibly in a confederation with Jordan, with equal political and human rights for all. In that event the right of return would be an issue that could be re-visited. A first statement by a restructured and re-invigorated PNC could also say that in its view the best solution to the problem of Jerusalem is for it to be an open, undivided city and the capital of two states. If I was drafting a first statement for a new PNC, I would also have it address head-on one of Zionism’s most absurd propaganda claims – the assertion that a Palestinian mini state would pose a threat to Israel’s existence. Even an armed Palestinian state neither would nor could. Why was explained to me many years ago by Arafat. When I raised with him the Israeli assertion, he began his answer with a question. “Do you really think we Palestinians are that stupid?” He went on to say that if a Palestinian mini state initiated any military or violent action against Israel, or even if it failed to prevent a terrorist attack on Israel by Palestinian dissidents from within its own borders, Israel would retaliate massively, perhaps even to the point of crushing the Palestinian state out of existence. Arafat’s main point was that after so many years of struggle and sacrifice to get a mini state, the Palestinians would not be stupid enough to give Israel’s leaders a pretext to take it away from them and close the Palestine file for ever. It seems to me that the policy guidelines for a new and credible Palestinian leadership answerable to a reconstructed and re-invigorated PNC are, or ought to be, clear. There is absolutely no point in seeking to negotiate with insufferably self-righteous and deluded Israeli leaders who are not remotely interested in peace on terms the vast majority of Palestinians (and also most other Arabs and Muslims everywhere) could accept. “Israeli leaders realized they could exploit the situation of the PLO leaders and, by dangling in front of them vague political promises as well as granting them some real personal privileges, get them to serve, in effect, as proxies for Israel in controlling and suppressing the Palestinian masses. Even more so in the light of Al Jazeera’s revelations, it follows, or so I believe, that the policy of a new and credible Palestinian leadership should concentrate on educating and mobilizing the citizens of nations, the Western nations most of all and America in particular, to press their governments to do whatever is necessary to end Israel’s occupation. A real commitment to do so by the governments of the major powers led by the U.S. is the absolute prerequisite for a real peace process. So am I, dear Anna, but if the Palestinian people are to be heard to good effect, they must be represented by a credible leadership answerable to a reconstructed and re-invigorated PNC. I was really looking forward to a post by you on the subject of the Palestine Papers. I still don’t know what to make of them - the reason being, I do not always trust Al-Jazeera Intl and I just could not bring myself to watch the channel long enough for any meaningful sign of their possible good faith. I imagine you are able to rely on your own sources for information on the Papers’ reliability. Yes, I remember very well your previous article on what a re-invigorated PNC could mean – and I think it is a very important point you are making. Perhaps there is a realistic chance the PNC might indeed heed the signs of the times and set out on a new start, now that something powerful is stirring up in the Arab world. A meaningful help might come from the Egyptian front, as we are learning this very day. And I find it very interesting you also mention Jordan as a possible future ally in the structuring of a Palestine state. It is both exciting and frightful to watch the domino-effect triggered off by the Tunisian revolt. It is frightening because we know that revolts are a bloody business – yet I see no other means for the liberation of the Arab population from their repressive regimes. Dear Alan, I think times are ripe for something to happen on the Palestine front. So many things have changed during the last couple of years. People have become more aware, authors – even Jewish and even Israeli authors - have written meaningful and revealing books that have opened peoples’ eyes, PressTv broke powerfully into our homes and has enriched our lives with outstanding programs such as your interview-series, and as a consequence many initiatives got off the ground to come to the aid of the besieged people in Gaza. The BDS is getting stronger – but not enough by far, much is yet to be achieved. All-over Europe and other Western countries ordinary people have repeatedly taken to the streets to speak-out for their brothers and sisters in Palestine and to denounce Zionists’ crimes – it happened even with the brave people of Germany, who face arrest if suspected of anti-Semitism. So, the way I see it, it is possible that any time now an unexpected event might arise to trigger the spark needed for things to get rolling to an unstoppable pace. When times are ripe, such events happen almost inevitably and they usually spring from unsuspected sources. Only wishful thinking? Perhaps it would have been, only a few years ago – but today … Today I have real hope, Alan, that Palestine is not a lost Cause at all – even as I write, I see PressTv’s “Breaking News” about the “Egypt Uprising” – I’m afraid Egyptians are in for harsh times. Very enjoyable and enlightening in your article is the quote from your friend Prof. Moshe Machover – a true little jewel. These beautiful insights are very entertaining - they make the content of your articles come to life. I've been contemplating a different solution. The Palestinians are too weak to resist the combined pressures of Israel and the U.S. Therefore, they cannot be a negotiating partner in any sense of the word. Israel was created by UN edict, which implied the simultaneous creation of a state/area for Palestinians. Therefore, it is the UN that should make Israel return to the 1967 borders and work out a permanent peace framework. I recently pointed out to Uri Avnery, who indicated 7-million dislocated Palestinians cannot possibly return to Palestine, that how come 20-million Jews in the world (who have never been in Palestine) presumably can? The nation of Israel lives Israel was promised and it was won fair in square. he does not posses can be his if he can rob you fair and square,would you concede your property . that territory was originally jewish!! it was stolen from them by christians and muslims, the dont just want the land they want israeli's raped and killed. god forbid they have anymore land to terrorize people than they already do! !palestinians are the oppressors. OPEN YOUR EYES!! Zen--was Rome Chriistian in 70 AD/ACE???? You Hasbara guys should at least get your facts straight! PNC would be a great idea; however, between PA and PNC the Israeli army would take over Palestine. that it is inevitable to go through the solution you proposed, but until then, we must all make the world know; as decartes believed, to fix something we must demolish and rebuild from the ground up. 1. there has been a Jewish presence in Israel for over 3000 years. 3. People always go around saying that Israel took the land in 1967 from the Palestinians. Well not true Jordan was sovereign. oh and by the way there was no such thing as the Palestinian cause before 1967 when Jordan was sovereign. 5. There are over 1 million Arab Israelis whom are not discriminated against and enjoy every right a Jew has in the country. Even if you disagree with me, lets all pray for peace. 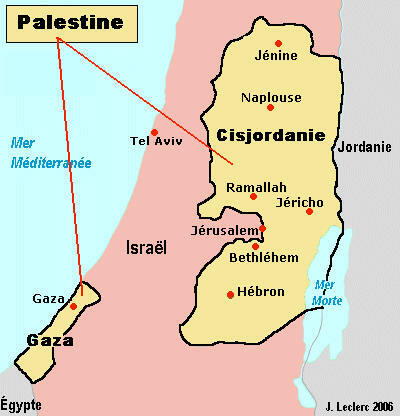 Palestine existed in prehistory, land of the Canaanites, and the Pilests. Palestinians don't wear suicidal vests nor do they believe in their efficiency. Gaza is on the edge of going through one more massacre, third civillian to be killed in the past 3 days by Israeli attacks on Gaza. The UN never "granted" Jews a piece of land, the UK did. Also, the number of Palestinian children shot by Israelis is vastly more than all Israelis shot. Freedom fighters fight for the right to be free from occupation, free to mobalize, free to eat, drink, breath what they want, and not be in a big prison.